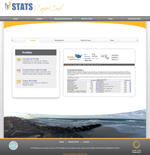 STATS CapeCod is collaboration between the Cape Cod Commission and the IBRC to provide a virtual data center to all users interested in better understanding the demographics and economy of Cape Cod. In partnership with BioCrossroads, the non-profit organization catalyzing Indiana’s life science industry, the IBRC researched and developed a set of key metrics to monitor the dynamic nature of this sector and its place in the national landscape. The center also created a custom set of online data tools BioCrossroads uses to track activity in state’s life science industry, updated automatically as new data are released. BioCrossroads leverages these data and analyses to report on important trends affecting this major sector of Indiana’s economy. The Indiana State Data Center (SDC) Program is a federal-state partnership between the U.S. Census Bureau and the State of Indiana. The Business and Industry Data Center portion of the program is managed by the IBRC, while the SDC program is led by the Indiana State Library as part of a state-level collaboration with its coordinating agencies: the Indiana Business Research Center, the Indiana Geographic Information Council and the Indiana Department of Workforce Development. This partnership was designed to provide demographic and economic statistics to all sectors of the community, including government agencies, businesses, academia, nonprofit organizations, and private citizens. STATS Indiana is a major provider of census data. The IBRC was a founding partner in the program and also spearheaded the first pilot version of this nationwide program. In partnership with the Governor's office and funding and guidance from the Lilly Endowment, the IBRC continues this effort to enhance the quanity and quality of data available to Hoosiers. Working closely with state agencies, the Information for Indiana initiative aims to improve the collection, quality and dissemination of data gathered by the agencies to better inform effective policy and decision making in Indiana. The Indiana Gateway for Government Units is part of this initiative and provides a central portal for local governments to submit forms to the Indiana Department of Local Government Finance and the State Board of Accounts. Another part of this initiative, the Indiana Workforce Intelligence System, gained national recognition by creating a data warehouse of integrated workforce and education data. IWIS helped us understand brain drain, workforce vulnerabilities, job creation opportunities, and the education-to-work skills pipeline. In 2014, the Indiana Network of Knowledge replaced IWIS as the state’s education and workforce longitudinal data system. The IBRC partnered with the labor market information offices, state workforce investment boards, and other research institutions in Indiana, Michigan and Ohio for the Driving Change Project, a consortium to analyze issues related to the restructuring of the auto industry in the tri-state area. The consortium worked with strategic partners in industry and government, and leveraged university expertise to analyze the specific nature of the auto industry transformation and the skills relevant to efficient and renewable vehicle technologies and other career opportunities in the green economy. It was funded by the U.S. Employment and Training Administration. Partnering with the Indiana Economic Development Association and the Indiana Economic Development Corporation, the IBRC developed and managed the Indiana Properties database to help site locators around the world locate available industrial sites and buildings throughout Indiana. An interactive response-management feature was also included, enabling site locators to follow up on particular properties with the state and local economic development officials. While continuing development of the system has been transferred to another organization, the IBRC maintains and updates the underlying properties database for research purposes. The Strategic Skills Initiative (SSI) addressed Indiana's critical job shortages and aimed to increase opportunities and wages for Hoosier workers. Throughout the state, money was awarded and solutions identified to encourage economic growth and better paying jobs in the state's 11 economic growth regions. Research and data essential to the development and completion of the Strategic Skills Initiative planning and grant documents were provided through a partnership of the Indiana Business Research Center, Workforce Associates, Inc., and the Indiana Department of Workforce Development. The Indiana Business Research Center, together with the Center for Sustainable Regional Vitality and the Local Government Academy at IU Northwest, researched the effects of market-value-based property tax assessment on the cities, towns and townships of Lake County. The study also examined the cost-effectiveness of local governments in the county. These findings were coupled with 19 recommendations for the residents and governments in Lake County. The IBRC and the Purdue Center for Regional Development conducted a wide-reaching study creating practical tools and frameworks to guide regional economic development strategy and decision making. A website makes the latest research on innovation and rural development available on geographic areas nationwide and includes the Innovation Index and Occupation and Industry cluster analyses. All of this is available in an easy-to-use format. Support was provided by the U.S. Economic Development Administration, with contributions from the Indiana Office of Community and Rural Affairs. The IBRC works closely with many different organizations and boasts a wide variety of collaborations, professional relationships and official responsibilities. For example, we have served many decades as the state of Indiana’s official representative to the Census Bureau, through the Indiana Data Center Program and the Federal-State Cooperative for Population Estimates, and more recently by serving as the Governor’s Liaison to the Census Bureau (Carol Rogers). Links to some of our partners are below.